Watching England’s unfortunate defeat at the hands of Italy in Manuas on Saturday left me with mixed emotions and now that the dust has settled on the somewhat disappointing result, I thought why not review the game from my own opinion as well as reacting to the media response to the game. The general consensus in the mainstream media is that whilst England lost, they at least had a go and therefore the focus of the majority of the reports is on the promising performance of the losers. In particular, Raheem Sterling was picked out for individual praise after his impressive first half performance. Whilst this praise is fair considering the problems he caused the ageing Italian defence, I felt that he was completely impotent in the second half and should of been taken off considering his increasingly lethargic movement from the beginning of the second half. 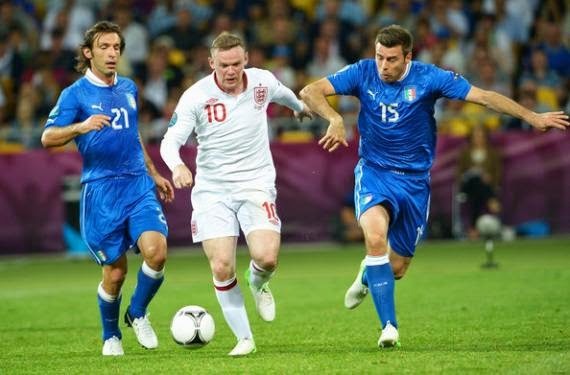 Another omnipresent story in the British media after the defeat was the continuation of the ongoing saga regarding Wayne Rooney’s place in the team, with many papers stating that he had an unimpressive game against Italy. I couldn’t disagree more. I, along with the nation have come to accept that a post-Euro 2004 Rooney is incapable of performing as he did in that tournament, where he tormented opposition defences with his direct running. For the first time since that tournament Rooney showed the same child-like enthusiasm and a willingness to take on a defender. This, as an England fan, was exciting to see. This coupled with his fantastic assist for Sturridges goal, capped off a promising performance from Rooney, The mainstream press are focusing on Rooney’s mistake in the match, which was the wasting of a decent opportunity. Although I acknowledge that that was an important moment in the match, it seems unnecessarily negative to disregard his promising performance to focus on the one miss. It’s even more unfair to create a media tirade aimed at getting Rooney dropped from the England starting XI. I believe this to be outstandingly negative and not useful journalism at all from the British media. Rooney is the one player in the team that strikes fear into the opposition and instead of supporting him, the media aim to weaken him and affect the decision making of Roy Hodgson. Credit must be given to Italy, who produced a fine performance, reminiscent of their recent 2006 world cup triumph. They dictated the tempo and took their opportunities when they came. Above all this they adapted to the temperature much better than England, due to their almost monopolization of the ball. After this performance I fully expect Italy to go far in this tournament. A place in the quarter finals is the bare minimum that this side can now go on to achieve. From an English perspective, I think they will go on and qualify second in the group. Costa Rica made Uruguay look a thoroughly average team and their reluctance to play Suarez shows just how unfit he is. The problem area for England is certainly at the back where Jagielka looked out of place in the international stage and Baines looked extremely vulnerable. In my opinion these two positions would be much stronger with Ashley Cole and John Terry occupying them, but that’s a separate issue altogether. I feel that the so called “young lions” showed enough to display that they are capable of stepping up to this level and I expect us to outscore both Uruguay and Costa Rica, but a place in the quarter finals is the best I expect England to do, which is not to say that that is a disappointing outcome.